The Indian Government has introduced plans to impose a nationwide ban on cow-slaughter across the country. A bill to that effect was approved by the cabinet on Monday and is waiting to be introduced during the current season of parliament. The new law will have to be approved by both the houses of parliament before it can be implemented. The issue is likely to cause stormy debates inside parliament and in the country at large. The eating of beef hardly raises an eyebrow in other parts of the world, but in India it is a highly sensitive issue, especially if you are a politician. Prime Minister Atal Behari Vajpayee went on the defensive last year when posters saying: "Cow is our mother and Atal eats her" appeared in his home state of Madhya Pradesh. "I would die rather than eat beef," he said. 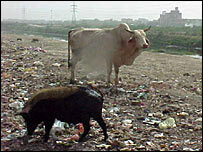 Cows are considered sacred by many of India's Hindus. Political dialogue has often been dominated by issues surrounding their care and protection. The debate has taken a remarkable turn as the country's two main political parties have begun battling over which one is the more 'Hindu'. In January, the Congress Party chief minister in the state of Madhya Pradesh demanded a nationwide law on cow slaughter. The move was seen as a pre-emptive measure against the campaign by the rival BJP party ahead of state elections in November. The demand has given a new impetus to campaigns for the protection of the cow. "Dairy owners extract every drop of milk from the cows and when they cease to be of any use they are simply left to die on the roads," said Gautam Grover, from the group, People for Animals. "There is a lot of illegal trading in beef going on despite the [bans in many states], we all know that. A national and more stringent law would perhaps help improve things." Cow-slaughter is banned in a majority of states except Kerala, West Bengal and the seven-north-eastern states. In Kerala, Muslims, Christians and even Hindus eat beef. The government spokesperson refused to give any details of the proposed law. But she said the ban would be binding on all states. Hindu hardline groups such as the Vishwa Hindu Parishad say a national law will help them in their campaign for cows. "Once the activists are armed with a national law, cow slaughter will soon become a thing of past. We will put 20 activists per 2,000 people to check any violation of the ban," VHP general secretary in charge of the cow protection campaign, KL Lodha, told the BBC. When asked about giving people a choice about what they want to eat, Mr Lodha said: "There are some people who may want to drink human blood, should they be allowed the freedom to do so?" Recently, in a book on India's dietary traditions, Professor DN Jha, spoke about historical evidence of beef-eating practices in ancient India. 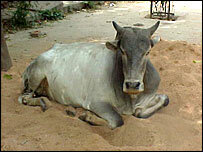 Cows are also revered by many in India who believe some cow products have curative powers. Scientists at the Centre for Medicinal Plants in Lucknow say distilled cow urine enhances the effects of any medicine and is used in traditional Indian medicine along with dung and fat. Many companies including the VHP have started selling cow urine for 10 rupees ($0.20) in some parts of the country. The Minister for Human Resources Development, Murali Manohar Joshi - regarded as a Hindu hardliner - has caused controversy by actively promoting ideas that his critics say have no scientific basis. But many in the BJP dismiss such views as disrespect for a great Indian heritage by pseudo-secularists.